When you select and configure your virtual and physical equipment, you must stay at or below the maximums supported by vSphere 5.0. The limits presented in the following tables represent tested, recommended limits, and they are fully supported by VMware. you select and configure your virtual and physical equipment, you must stay at or below the maximums supported by vSphere 5.5. 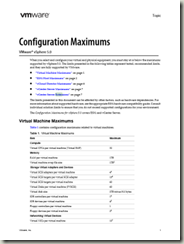 The limits presented in the following tables represent tested, recommended limits, and they are fully supported by VMware.